Entering his junior season, Covey is more than halfway to Utah’s career receptions record. Britain Covey has not seen the final play of his sophomore season, the second-half kickoff of the Pac-12 championship game vs. Washington. “And I never will,” he said last week, standing on the Utah practice field, where he will resume catching passes in preseason camp in August. 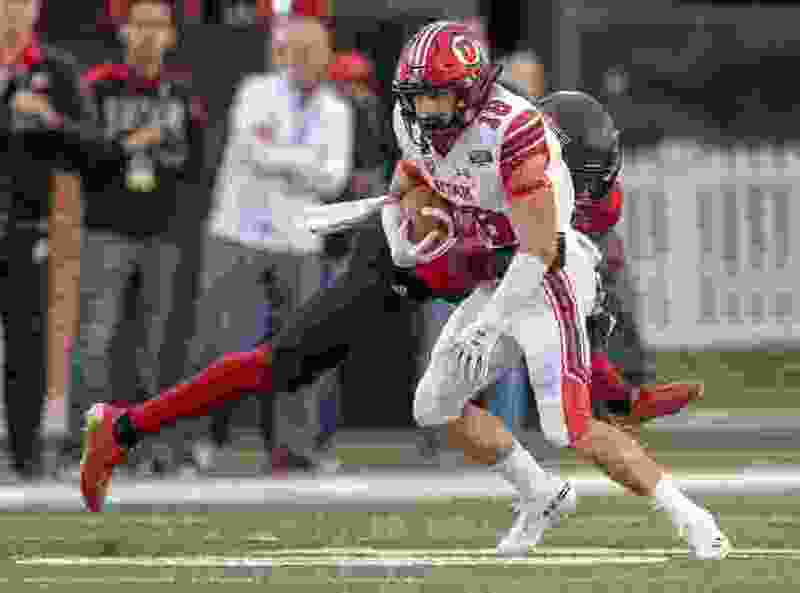 The Utes are staging spring practice without Covey, who was named one of the team’s five spring captains, stemming from his offseason leadership. He won’t watch the film of the tackle that injured his knee, wanting to prevent the image from making him hesitate, the next time he’s running with the ball. Covey is about halfway through his scheduled rehabilitation after surgery repaired his ACL and meniscus. He’s already running. The most visible element of his medical status is the brace on his right arm, and Covey now is acknowledging that he played the second half of the 2018 season with a broken bone in his right wrist. It’s true: The receiver threw touchdown passes on trick plays against Arizona and UCLA, after sustaining the fracture in the first quarter vs. Arizona. He’s now resting the wrist that he reinjured while lifting weights this past winter. Utah’s medical staff cleared Covey to play, saying he wouldn’t further damage his wrist. Ute tight ends coach Freddie Whittingham, for example, played in the 1989 Holiday Bowl for BYU with a broken bone in each wrist. Covey’s concession to the injury was not fielding punts during practice. In games, he let some punts bounce instead of catching he ball, and he tried to hold the ball with two hands while running after making receptions, lacking strength in his right hand. Covey’s receiving production dropped off, following the injury. He caught 39 passes in his first six games and 21 passes in his last 6½ games. But he made the All-Pac-12 first team as a return specialist. He almost managed to play all 14 games. But just as Covey planted his leg during the kickoff return in the conference title game, Washington's Isaiah Gilchrist tackled him from the side. Covey “knew right away” that the injury was significant, he said. The irony is multidimensional, in this case. Covey unofficially led the nation in fair catches of kickoffs in 2018, following coaches’ instructions about maximizing a new rule that allows teams to take the ball at the 25-yard line. He was determined to return the second-half kickoff, though, with the Utes trailing 3-0. So he caught the ball at the 1-yard line and started running. He made it to the 18, where his season ended. After all of the punishment the 5-foot-8, 170-pound Covey absorbed from Washington’s secondary in the teams’ first meeting in September, he got hurt on a routine return in November. Covey will get another shot at the Huskies, Nov. 2 in Seattle. At the moment, even August seems a long way off to him. When he tweeted about his surgery in mid-December, he promised to “be back before you know it.” But he's in the midst of the rehab grind now, working on his knee 90 minutes to two hours daily. Last season’s evidence shows that he can make a big impact, from a starting point in August. He missed spring practice in 2018, having just returned from a mission for The Church of Jesus Christ of Latter-day Saints in Chile. Covey’s 60 receptions nearly doubled the season total of Utah’s No. 2 receiver, Jaylen Dixon. Covey will enter his junior year with 103 career catches, more than halfway to Kevin Dyson’s Utah record of 192. 192 – Kevin Dyson (1994-97). 177 – Bryan Rowley (1989-93). 156 – Dennis Smith (1986-89), Paris Warren (2003-04). 152 – Jereme Brooks (2007-10). 149 – Carl Harry (1986-88). 140 – Loren Richey (1985-86). 135 – Travis LaTendresse (2002-05), Derrek Richards (2004-07). 134 – Dres Anderson (2011-14).